Indian Summer CAL week 1 is out now for you to download on the Deramores website. Eeee!!! It’s so exciting! 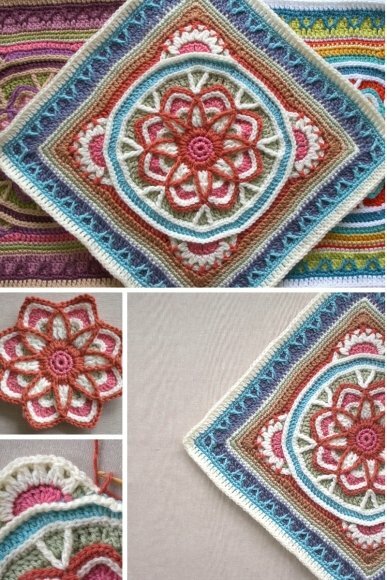 In this first part of the pattern we’ll be making the three central squares. The squares are Intermediate skill level as the pattern uses stitches worked in the horizontal bar to add some lovely texture. You can find the horizontal bar (also known as the third loop) at the back of stitches just below the back loop. I wrote a blog post about how to work in the horizontal bar recently so do check it out here if its a new technique to you. We’ll also be using lots of Front Post / Front Raised stitches to add even more lovely texture! Share your progress on the Deramores: The Projects facebook page and if you are posting online use the hashtag #GoTeamIndianSummer. We just can’t wait to see your photos!!! You can also add your projects to Ravelry here – pattern on the Ravelry database. Hope you love the squares and don’t panic if you don’t get them finished in a week – we won’t need them again for a few weeks yet. Next week we’ll be making a collection of cute little squares. Indian Summer CAL New Colour PacksIndian Summer CAL Week 2 – Out Now! Hi, asking from Spain. I`ve already begun the CAL and I wanted to ask if row 9 is correct? Thanks a lot for this CAL!! We’ll spotted, thank you!!! It should be the skipped stitches in round 6, not round 7. Will get this updated. There will be a little bit of ruffling which should flatten out as you work the rest of the square. If it’s really serious ruffling send me a photo so I can see what’s happening (woolnhook1 at gmail dot com). Please can you tell me what is changed in version 3 UK terms? Also, Row 2 Corner Flowers says 2dc tbl in each stitch of Row 1 but the picture shows trebles. Thank you. I am stuck here to. Trying to follow photo on 21 as the directions do not seem to make sense? Hi, is this pattern only free when you order the wool?